Supply chain representatives require much more than an online contact management system, they require real-time access to all customer and product information anytime, anywhere they need it. 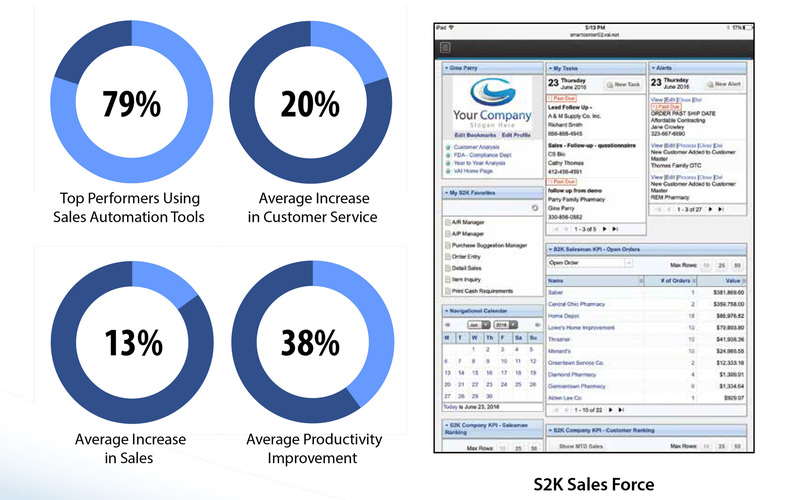 With S2K Sales Force your sales team has the ability to search the product catalog, check price and availability, see related products, new products, and current promotions. They can enter and track the status of quotes, returns, and customer orders, and they can review accounts receivable balances and payments. Sales analytics screens give your sales representatives insights into customer behavior, and allow them to react quickly to customer issues and opportunities. This application will empower your sales team to drive new business and make the most of their sales calls. A salesperson’s success is linked to his or her ability to communicate clearly and develop client relationships. S2K’s marketing tools allow representatives to create personalized campaigns to keep all accounts updated on new products, pricing, and promotions. Representatives use sales data to act on customers buying behaviors and stay in constant communication that can lead to new business opportunities.